Only Bullfrog Spas are built to be virtually leak-proof. The JetPak Therapy System provides unmatched reliability. Bullfrog Spas are the world's only spas built with our patented JetPak Therapy System. 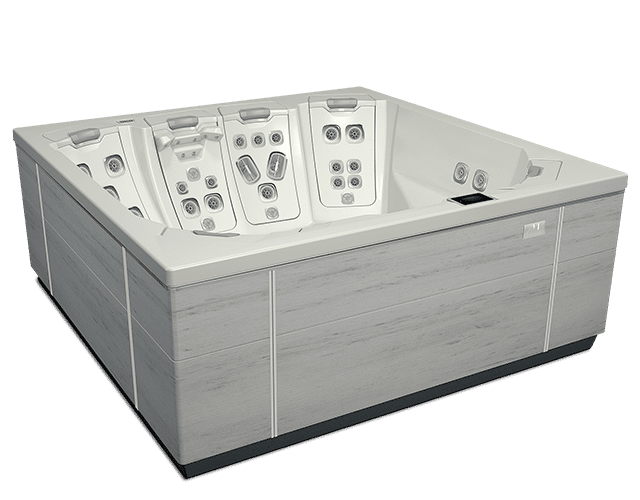 Because the JetPak Therapy System is engineered to eliminate 90% of the plumbing of conventional hot tubs you can be assured a worry-free hot tub ownership experience for years to come. Relax, this advanced engineering and design means that you will never have to worry about your Bullfrog Spa. Bullfrog Spas have up to 90% less plumbing and fewer perforations than traditional spas. Even if a JetPak happened to develop a leak, which is extremely rare, the water would stay inside the spa. JetPaks are so efficient that they have the portable hot tub industry’s strongest warranty. Bullfrog's massaging jets are fitted into our patented modular JetPaks that rest within the spa. This means no holes need to be drilled into the outside spa shell for these jets. The hot tub remains virtually free of holes and, consequently, completely water tight. Look at the difference. The Bullfrog Spa on the left has 90% less plumbing behind the seat than the conventional spa on the right. SpaDesign allows you to choose the spa model and layout you want, the JetPaks you need, and the color combination that compliments your home and landscape.